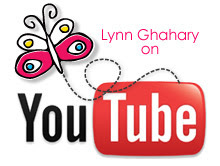 Lynn Ghahary :: Pieces of Me ...: PageMaps and Pebbles - Video Share! 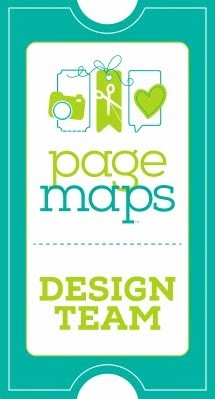 I used the fabulous new Seen & Noted collection by Pebbles for this layout. The colors in this collection are so cheerful and perfect for so many different themes. I converted my photo to black & white and used a die cut to house several different patterned papers within my layout design. I had fun with the circular Silhouette shape I cut and layered on my background, filling the different circles with various patterned papers, and embellishing with stickers. I also cut my title with my Silhouette in coordinating grey cardstock and embellished the "o" in "photo" with a cardstock sticker for a sweet little pop of color. I used an enamel dot from My Minds Eye to add a little detail and dimension to the heart, as well as on a few other places around my layout since the colors seemed to match this collection perfectly. The Seen & Noted collection had lots of great embellishments and coordinating products including the tag and pocket I used to house my journaling. I printed my journaling on the tag and added an Ali Edwards for Technique Tuesday stamped phrase in red for a punch of color. Here's the video I created to go along with this layout. ENJOY! Love your LO especially the background die cut. Love how you added details to jazz it up and I'll definitely be looking forward to this collection by Pebbles. Great layout, Love the circle background. This page is absolutely fabulous!! I love your style and videos!! Thank you for the video! 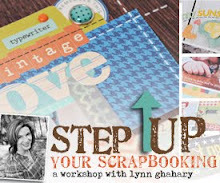 I never get tired of your layouts, Lynn :-) And it's even MORE FUN to watch you put them together. Love your layout. Did you design the title yourself or was this a purchase from the store too?